Ord’s art style is unique and memorable. After seeing it once, one will always recognise her art. Her sense of timing is also refined and she relentlessly hits the right beat throughout these narratives for her kind of storytelling. And what is her kind of storytelling is, you may ask? Ord strives to explore and recreate the little events, frustrations joys and turmoils of life – louts being too loud on train; the “what-if” induced by a near-miss traffic accident; relationships in their good and bad moments­­-most of which are heavily autobiographical (the main character’s name is ‘Ord’ after all). In a couple (‘Undergrowth’, ‘O Bearded Ones’) Ord slides in a bit of magical realism. Further appeal lies in the portrayal of Melbourne where most of the tales are set. Having lived in Melbourne myself now for a while I recognise the suburbs and general city landmarks like trains which Ord recreates. I found myself trying to recognise exact places streets, and this all adds to the appeal of her comics. While I am starting to like her artwork more and more, having seen it develop from the early Wilnot days (when the Ord character had two eyes) personally I’m ambivalent about Ord’s narratives and her Melbournian, cyclopean protagonist in Sensitive Creatures. For me, most of these tales aren’t fully realised providing a strong opening, and then … ending. I found some to have great set-ups only to finish leaving me wanting to find out more about the characters that she’d just introduced. Examples include ‘The Comic Teacher 2’ where a boy who shows Ord the stabbing scar his mother inflicted upon him, and then proceeds to inform Ord that he’d like to give the picture he’s just drawn to her as a present. Similarly in ‘Harvest’ when Ord is told she needs to “put herself out there more” she puts herself out to be inspected by customers in her grocery store only to have one want to take a piece of her home! Ord refuses. To my thinking both are great beginnings to longer narratives. What would’ve happened if she’d allowed a piece of herself to be taken home and what problems would’ve this presented? It is perhaps Ord’s strength as a storyteller rather than weakness that I want to know more rather than less about the characters and their lives that she presents in Sensitive Creatures. Allen & Unwin once again should be applauded for their commitment to Australian graphic novels and comic artists. More recently they’ve supported Bruce Mutard’s The Silence and Bernard Caleo’s Tango Collection, and Dan Hallett and Johnathan Walker’s excellent Five Wounds. 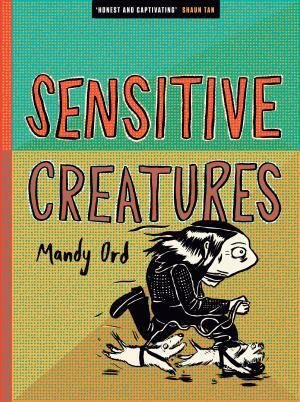 Sensitive Creatures is a worthy addition to their publication list and your bookshelf.